Those of us who live in the United States claim that democracy is the central tenet of our social and political relations. It is, we say, the basis for how we govern ourselves, the concept by which we measure the wisdom and worth of social policies and shifts, the ethical anchor we seek when our political ship seems to drift. And it is the standard we use to measure the political progress of other countries as well as their trade status with our own. It is not surprising, then, that the word democracy seems to be heard more frequently these days. In many places around the world, oppressed peoples struggle for human and civil rights. Dictatorships and popularly elected governments are overthrown at a startling rate. In the United States, growing numbers of people claim that politicians at all levels are no longer in touch with their constituents. Conflict among political, religious, and cultural groups fuels debate over free speech, privacy, land use, lifestyles, and, throughout it all, the rights of the individual in relation to the interests of the larger society. Amid this dissonance, the idea of democracy presumably serves as a crucial benchmark for judging events and ideas. Central tenets and ethical anchors, however, also tend to be converted into rhetorical slogans and political codes to gain popular support for all manner of ideas. Thus, they are fraught with ambiguity. Democracy is no exception. Woodrow Wilson understood this well when he deflected opposition to U.S. involvement in World War I with the virtually unassailable statement that our soldiers were fighting “to make the world safe for democracy.” Calling for the word democracy did trick then and has done so for a wide array of political and military maneuvers since. …. [If] the meaning of democracy is so confused in the larger society, how can we possibly settle on its meaning for everyday life in schools? That risk in mind, we have gone ahead, buoyed by certain beliefs. We believe that democracy does mean something and that bringing that meaning to light is critical at a time when many citizens are vigorously debating the future course of our schools. Moreover, we find it hard to imagine that people who have known the privileges of democracy would so easily give them up. We find it even harder to imagine that they would not want these privileges for their children, indeed for all people. We admit to having what Dewey and others have called the “democratic faith,” the fundamental belief that democracy has a powerful meaning, that it can work, and that it is necessary if we are to maintain human dignity, equity, freedom, and justice in our social affairs. Democracy works in multiple ways in social affairs. Most of us who attended school in the United States (and perhaps elsewhere) were taught that democracy is a form of political governance involving the consent of the governed and equality of opportunity. For example, we learned that citizens may directly and fully participate in such events as elections while being “represented” in other matters by those we elect to federal and state legislatures as well as boards and committees governing local school policy. But democracy is not only a “process.” It also involves values and principles that make up the foundations of “the democratic way of life” … . Concern for the dignity and rights of individuals and minorities. Faith in the individual and collective capacity of people to create possibilities for resolving problems. The open flow of ideas, regardless of their popularity that enables people to be as fully informed as possible. The use of critical reflection and analysis to evaluate ideas, problems, and policies. An understanding that democracy is not so much an “ideal” to be pursued as an “idealized” set of values that we must live and that must guide our life as a people. The organization of social institutions to promote and extend the democratic way of life. If people are to secure and maintain a democratic way of life, they must have opportunities to learn what that way of life means and how it might be led … . Although common sense alone tells us this is a true statement, there is perhaps no more problematic concept m education than that of democratic schools, a concept that some consider almost an oxymoron. How can this be so? Simply put, many people believe that democracy is nothing more than a form of federal government and thus does not apply to schools and other social institutions. Many also believe that democracy is a right of adults, not of young people. And some believe that democracy simply cannot work in schools. Since democracy involves the informed consent of people, a democratic curriculum emphasizes access to a wide range of information and the right of those of varied opinion to have their viewpoints heard. Educators in a democratic society have an obligation to help young people seek out a range of ideas and to voice their own. Unfortunately, many schools persistently shirk this obligation in several ways. First, they narrow the range of school-sponsored knowledge to what we might call “official” or high-status knowledge that is produced or endorsed by the dominant culture … . Second, despite decades of pressure for change, they continue to silence the voices of those outside the dominant culture, particularly people of color, women, and, of course, the young … . This observation can be substantiated with little more than a glance at textbooks, reading lists, and curriculum guides. “The Future of Our Community,” “Justice,” “Environmental Politics,” and so on. 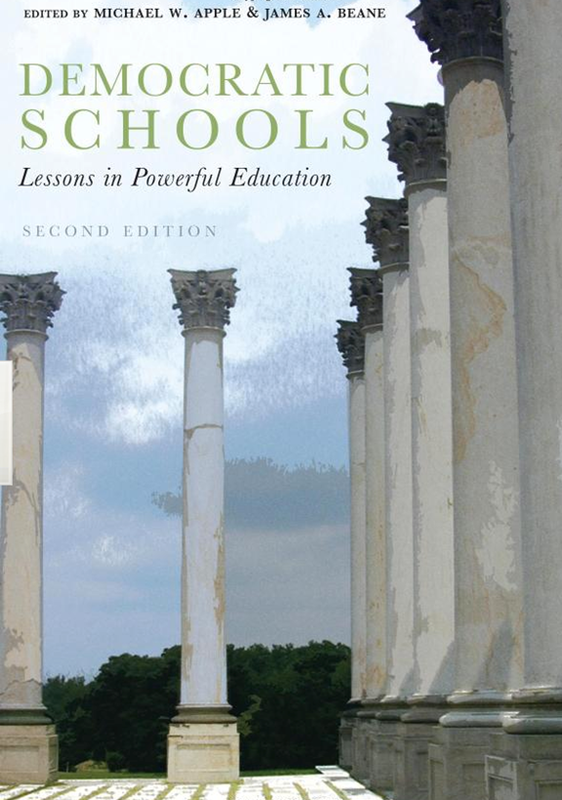 [D]emocratic schools are in part distinguished from other kinds of progressive schools in that they explicitly seek change in antidemocratic conditions in the school and society. Educators who work in democratic schools, however, are also acutely aware that such conditions, and the obstacles to larger access, must be reckoned with until they are changed. For this reason, a democratic curriculum seeks to help students become knowledgeable and skilled in many ways, including those required by the gatekeepers of socioeconomic access. In short, democratic educators live with the constant tension of seeking a more significant education for young people while still attending to the knowledge and skills expected by powerful educational forces whose interests are anything but democratic. We cannot ignore dominant knowledge; having it does open some doors. But we must be careful in our interpretation here, because we do not want to endorse a continuation of the rigid “drill and skill” programs that are so often used as a weapon to manage and control the school lives of nonprivileged children … . These children, too, have a right to the best of our progressive ideas. Our task is to find ways to organize dominant knowledge so that it is accessible to the least privileged children without compromising their right to rich educational experiences. This task is more urgent now as standardized programs and tests increasingly strip the curriculum of all but the most trivial and disintegrated facts and skills. The matter of creating a democratic curriculum is almost certain to involve conflict and contention. Practically all that is included in this sketch comes up against much of the dominant and longstanding view of what the planned curriculum ought to be about. The possibility of hearing a wide range of views and voices is often seen as a threat to the dominant culture, especially since some of those voices offer interpretations of issues and events quite different from those traditionally taught in schools. Worse yet, encouraging young people to critically analyze issues and events raises the possibility that they might call dominant interpretations (and teachings) into question. The same is true for organizing the curriculum around major social problems and issues, but this arrangement also comes into conflict with the sterilized version of knowledge and skill that is part of the strictly separate-subject, discipline-centered, “high culture” approach to curriculum. And, finally, the possibility that young people might contribute their own questions and concerns to the curriculum raises the threat of touching on issues that reveal the ethical and political contradictions that permeate our society.